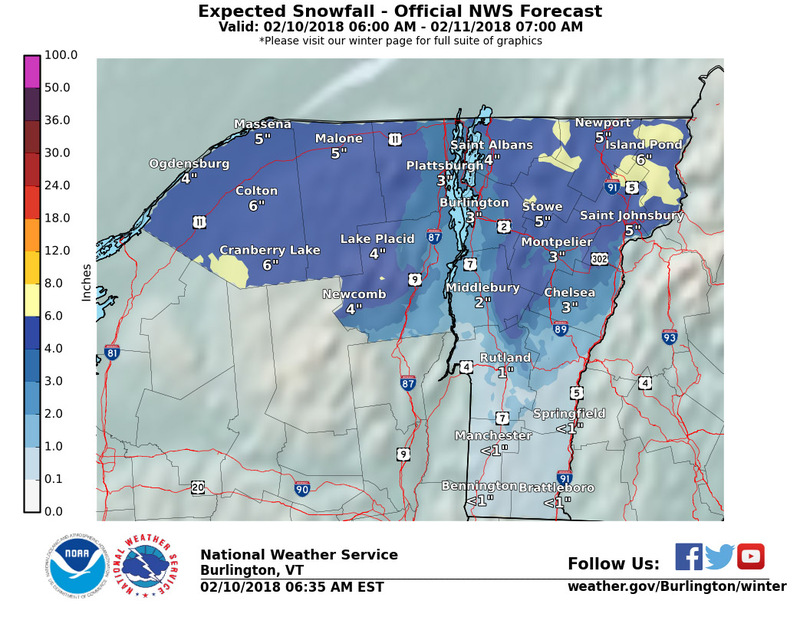 For the valleys in Northern Vermont, our first big winter storm of the season hit the area this week, and it created some potential holiday travel woes because of its occurrence so close to Thanksgiving. The storm was essentially complete by the time we traveled on Thanksgiving Day, but with 8.2 inches of snow, and 1.62 inches of liquid equivalent, it had certainly bolstered the snowpack in the yard and changed the look of the landscape. While the storm did have some mixed precipitation and rain in the middle, it was quite a nice gain in snow for the mountains, with some of the ski areas in the Northern Greens picking up more than foot of snow. And, as is often the case, the final volley from the storm consisted of a good shot of dry powder that sat well atop some newly added dense base to create some great Thanksgiving Day skiing. 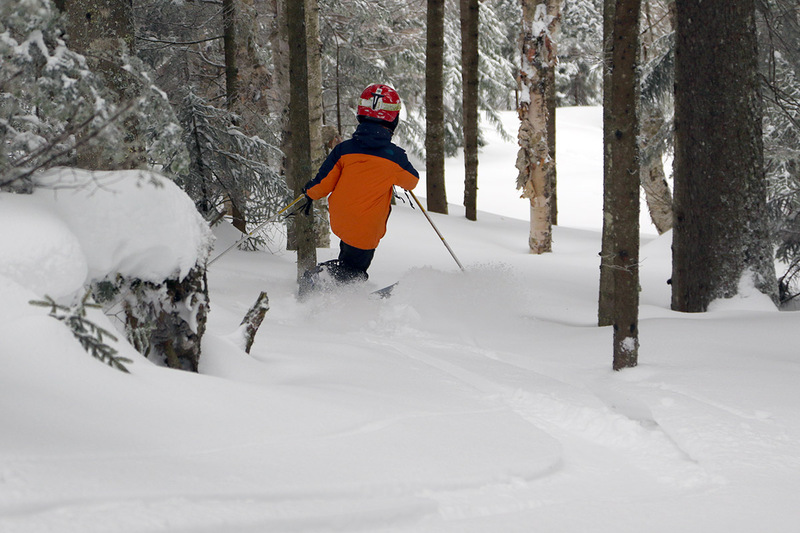 With our holiday traveling done, we finally had the chance to get out today and sample some of the new snow. 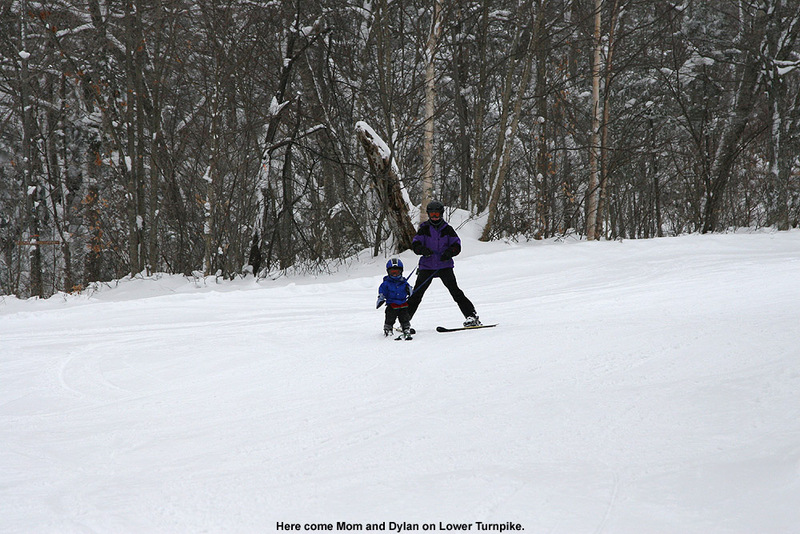 Dylan was away at a friend’s house, but E, Ty, and I headed up to Bolton Valley to earn some turns. They had reported 9 inches of new snow for Thanksgiving morning, and as we headed up to the Village, we stopped in at the base of Timberline at 1,500’ to check on how the snow had settled in down at that elevation. The depth of the powder was 3 to 4 inches over a good base, and we could see that there had been plenty of ski activity on Timberline’s slopes. 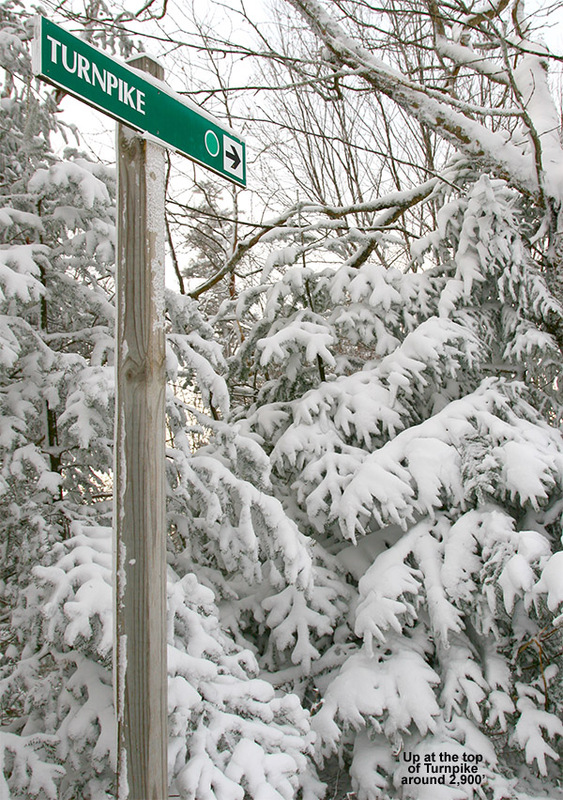 Continuing on up to the Village at 2,100’, we found that the snow had increased to 4 to 6 inches in depth. Having experienced some good snow on Turnpike on Sunday, I figured that we would check that out again today. Of course, with it being two to three days since the snow fell, plenty of skiers and snowboarders had been out on the trail, a lot more than the single track I’d seen on my last trip. We were treated to a nice skin track, but most of the powder was tracked out, so we definitely kept our eyes open on the ascent for lesser used options. We ran into Cam at the top of Lower Turnpike, and chatted about the mountain’s opening in a couple of weeks. If we can stick with the current weather pattern, things are looking quite good. Like I’d done on Sunday, we stopped our ascent around 2,900’ on Turnpike since the terrain above that level was rather windswept, but snow depths had increased to roughly 6 to 8 inches, and combined with the base, there was easily over a foot of snow sitting there in many places. On the ascent I’d looked at the snow on Cougar and the Wilderness Lift Line, and I’d seen only a couple of tracks, so we worked those into our descent. 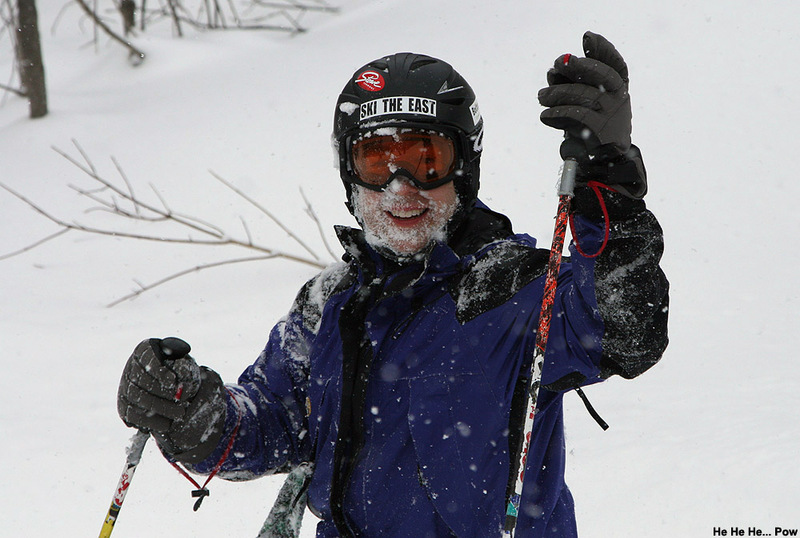 The powder skiing was every bit as good as what I’d experienced on Sunday, and I was glad that we found plenty of untracked snow for Ty and E. Ty was putting together some great turns on his Teles, and I think his skiing was helped by the fact that he was in high spirits. 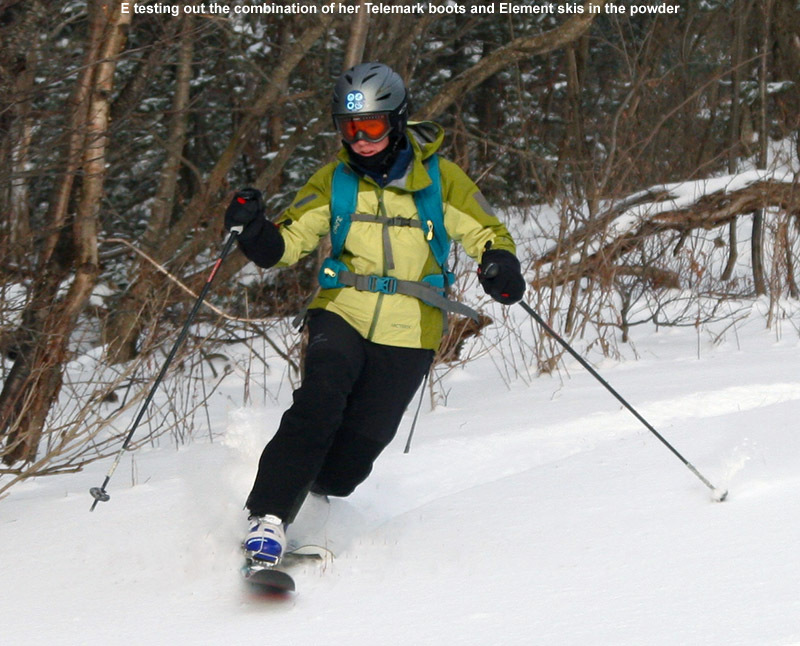 E had her first chance to get on her Element skis with her new Telemark boots, and she definitely felt a big increase in control that she’d previously lacked with on her fat skis with her old boots. 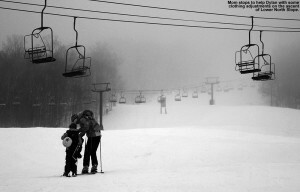 Today was a great, mellow outing, just like you’d expect pre-season at Bolton Valley. 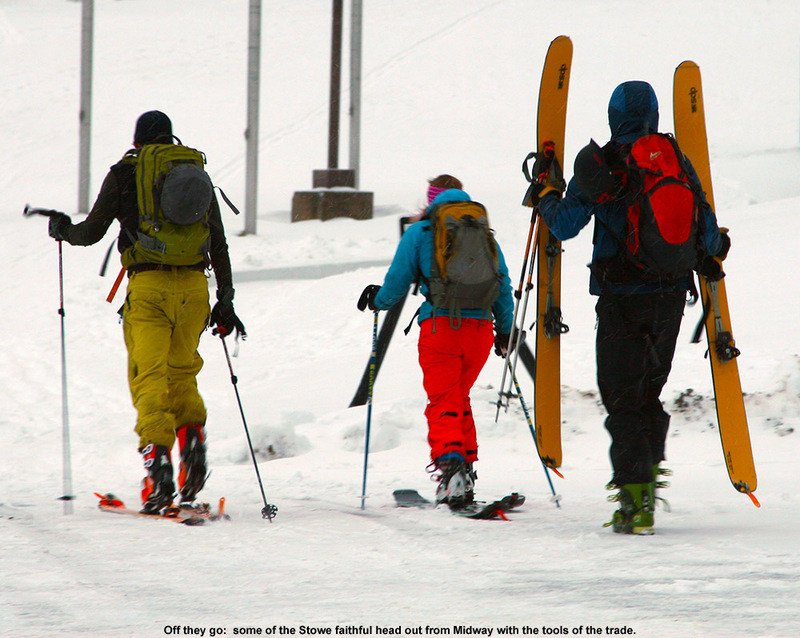 Along with Cam, we saw a couple other pairs of skiers, and they all appeared to be experiencing that same vibe. We’ve actually got our next small storm coming through tonight, and it’s supposed to persist into tomorrow, so perhaps we’ll get a freshening of the powder that will set things up for more turns. 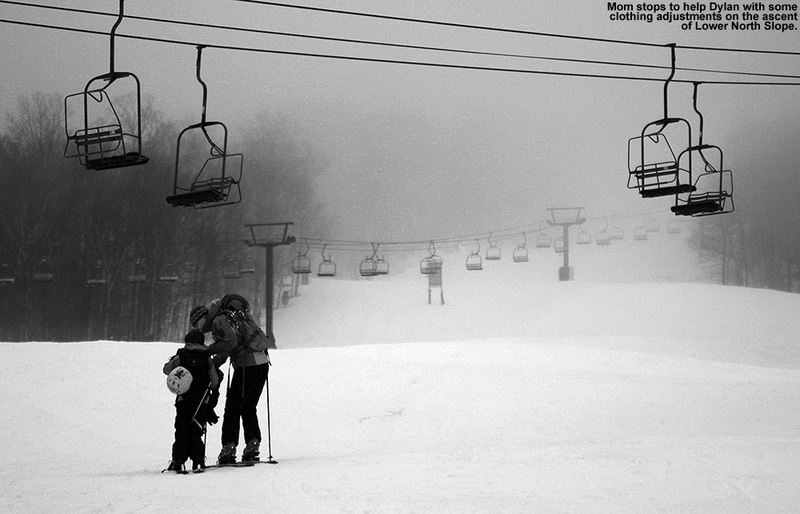 It’s been a great November of skiing around here, and now it’s on to December – let’s hope it can follow suit. 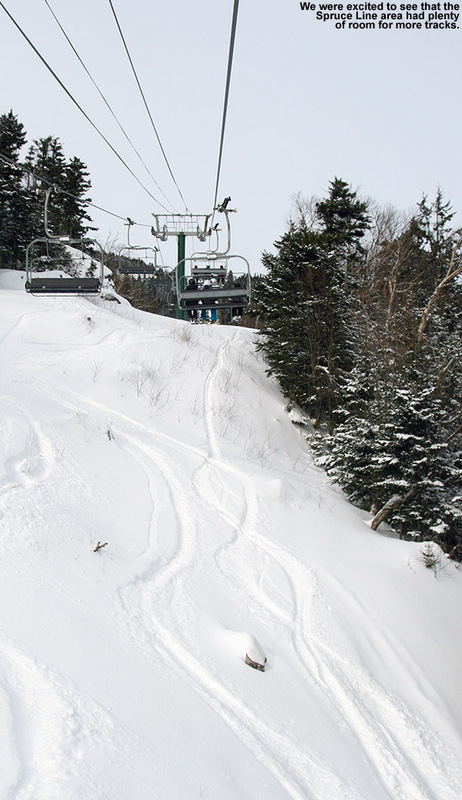 I hadn’t yet been up to Bolton Valley for turns this season, because based on what the web cams have been showing for all the storms thus far, the slopes at Stowe have seen bigger accumulations and better coverage. This time around though, things seemed more equitable. 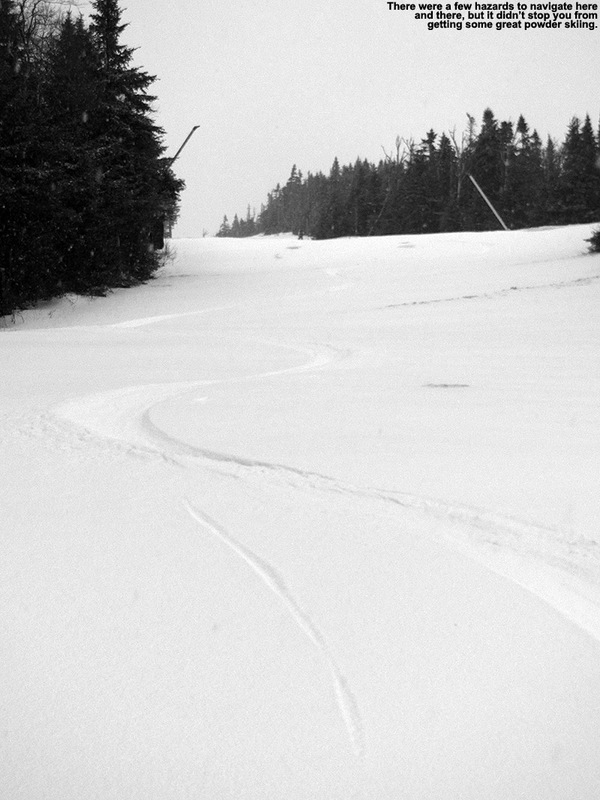 I’d seen the general state of coverage at Stowe when I stopped there for a tour on Thursday, so I had a good idea of what was down after the additional 4 to 6 inches reported this morning due to the recent Alberta Clipper. I could see from the Bolton Valley Live Web Cam that, although there was definitely some wind pushing the snow around and scouring some areas, accumulations were at least in the same ballpark as what Stowe had seen. As long as I went for a protected section of the mountain, it looked like coverage was going to be sufficient for some good powder turns. I wasn’t initially sure if I’d want to head out to the slopes today, since just a few inches of snow were expected from the clipper, but more due to the fact that the coldest air of the season has moved in on the back of this storm. With significant winds as well, it sounded like it was going to be brutal out there on the mountain. The reality was though, that this was November cold, not January cold. 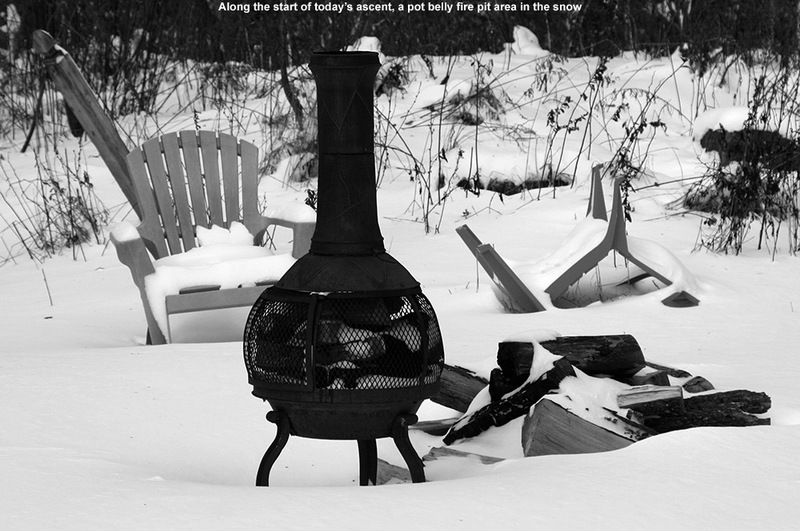 When we were out in the yard early this afternoon taking some potential Christmas card photos, the temperature was in the low 20s F and it was reasonably comfortable. It was going to be colder and windy on the mountain, but it seemed like great weather for earned turns. I headed up to the mountain in the mid afternoon, made a quick Timberline stop at 1,500’ to measure the snow depths, finding 2-4”, and then parked in the top tier of the village lot around 2,100’. The temperature was in the mid teens F, and snow depths had increased to around 4-5”. After a conversation with Quinn subsequent to one of our recent October snowstorms, he’d mentioned going for an outing on the Turnpike trail, and with today’s accumulations and wind, that sounded like the perfect, protected option for an afternoon ski tour. I found a nice skin track that had been set in place by a prior skier, and it brought me up through some beautifully protected terrain. I think this was actually my first time ascending Turnpike on skins, and it is indeed a nice route. It’s got that type of modest pitch that makes you feel like you’re out for a stroll and hardly doing any work. The coverage was looking decent, and there was even a bit of old base snow that was initially sporadic, but increased as I got higher on the mountain. At 2,500’ I found snow depths in the 5-7” range, and I continued to follow the skin track up to around the 2,800’ mark, where it terminated. My plan was to ascend as high as the quality of the snow dictated, stopping when the winds or terrain outweighed the elevational increase in accumulations. Whoever had made that skin track had the right idea, because at 2,800’ it was starting to get to that point. I pushed on to 2,900’ at the top of Turnpike, and called it there because the next pitches on Peggy Dow’s were clearly steeper, rockier, and exposed to the wind. The snow had definitely been getting deeper though, and I’d say the depth of the powder up there was 7” or more. I was unsure exactly how the descent was going to go. I’d chosen Turnpike because it has that protection from the wind, but also a nice combination of blue/green pitch and a generally grassy, not rocky, surface. 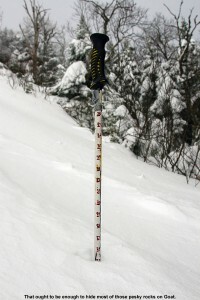 The new snow was quite dry, but I’d brought my fattest Tele boards, my AMPerages at 115 mm underfoot. I was banking on that width to keep me afloat. I dropped in for my first turns, and another aspect of the snow conditions quickly became apparent… the snow was indeed light and dry, but it was cold enough that it was also slow. I was worried that the lack of glide in the dry snow was really going to affect the descent, but as soon as I hit the first steeper pitch the turns started flowing. Coverage was definitely adequate, and I touched down on the old base or grass very infrequently. 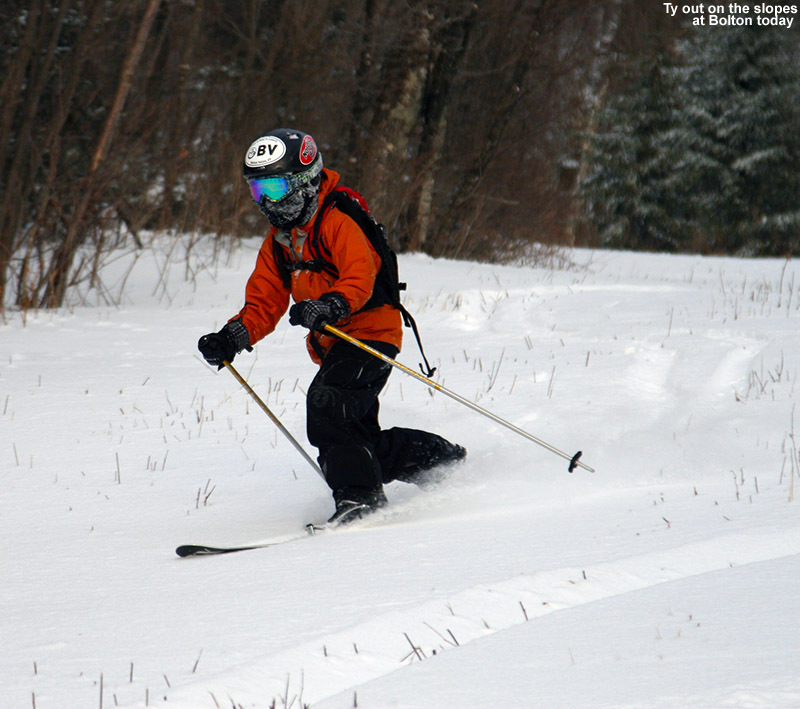 Turns were very smooth, and as I was gliding my way down, I was confident that I’d made the right ski choice for the day. In fact, it felt like the perfect ski choice, and amazingly, given the situation I think I would have gone even fatter with the skis. People are always pushing the fattest skis for the deepest powder, and that definitely makes sense in terms of floatation, but they’re good for so much more. Indeed I find them absolutely horrible on firm snow; it’s a lot like trying to ride a snowboard on a hard surface. 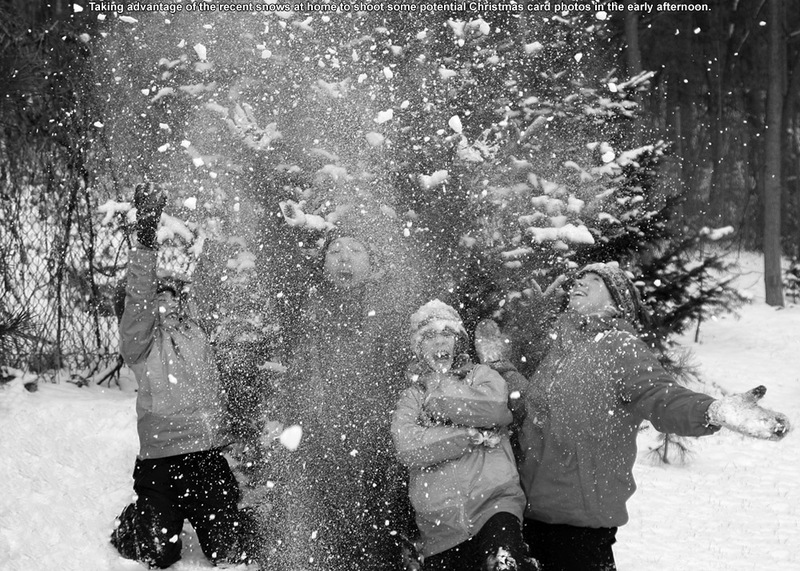 But today didn’t have anything to do with firm snow, it was all powder… light, dry powder, and the fatties shone in just modest depths in multiple ways because of their floatation. First, despite the airy snow, they were keeping me off the subsurface and allowing bottomless turns. Second, and this one was totally unanticipated prior to discovering how dry and slow the snow was, they were allowing me to plane at the more modest speeds attained on today’s moderate pitches. That kept me going on lower angle pitches, really enhancing the fun factor, and it’s been one of the few times when I’ve had the feeling that even wider skis wouldn’t have been overkill. If you’ve ever heard of the “no chain” expression in cycling, for when the pedaling seems effortless, then the expression for today’s ski outing would be “no width”. 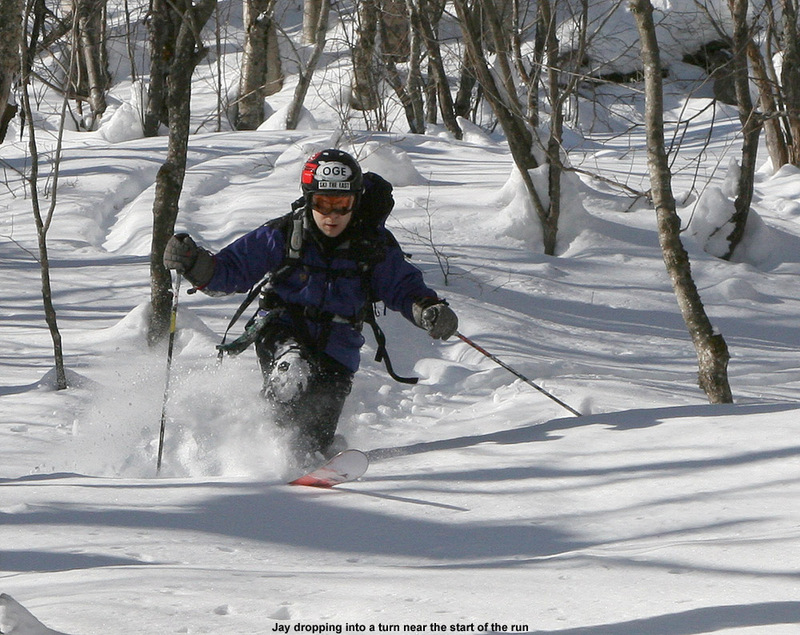 Even though it was all Telemark turns, in which transitions are much slower than alpine, things seemed to move effortlessly from edge to edge during the turns, and it all just flowed. Looking ahead, we’ve got a small system expected to affect the area tomorrow night with some snow, and then a much more significant system as we move toward Thanksgiving. That one could be messy with some mixed precipitation, but hopefully we’ll get some snow out of it as well. 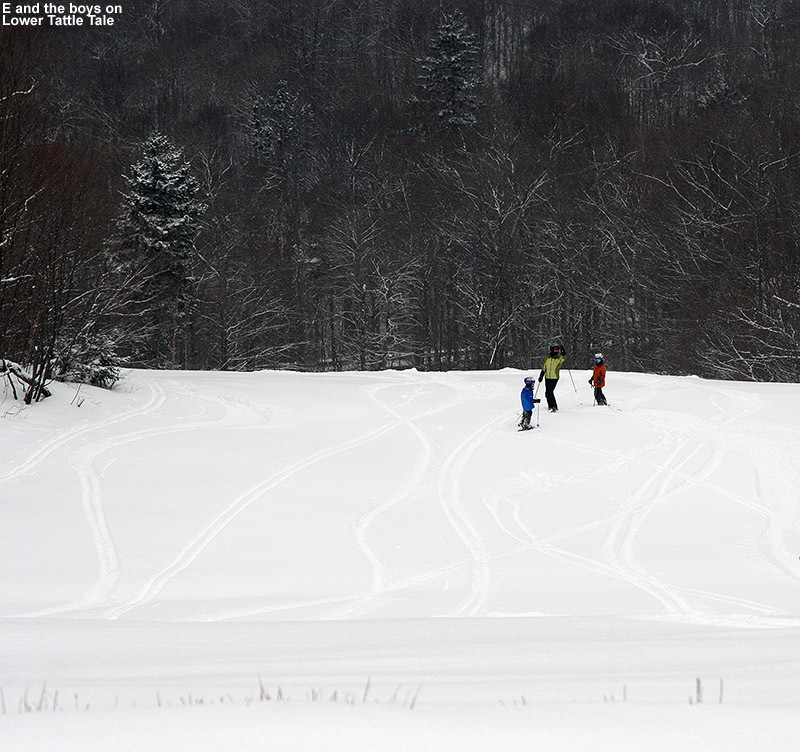 We were last out at Stowe for turns on Sunday, and since that time there really hasn’t been much in the way of new snow – about an inch fell at 1,500’ on Tuesday, with probably a couple of inches up near the Mansfield ridgeline. That wasn’t much to inspire one with thoughts of great ski conditions, but since I was in Morrisville today for the annual BJAMS Thanksgiving lunch, on the way home I decided to pay a visit to Mt. Mansfield and make use of the energy provided by that great meal. 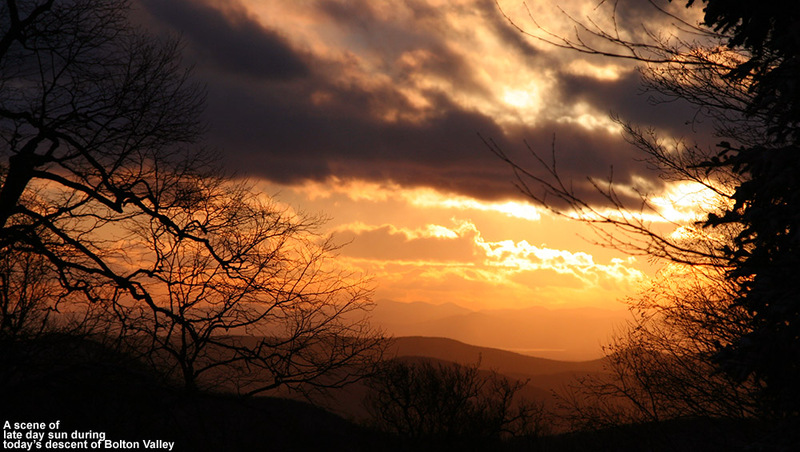 Temperatures that were in the teens this morning were hovering near 40 F in the mountain valleys and up at the Mansfield Base in the early afternoon. Although it was above freezing, the air seemed quite cold and there was no melting going on – the dew points were just sitting there down in the teens. 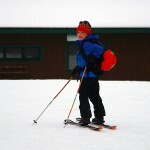 I parked a bit north of the Mansfield Base Lodge, got my gear together and began skinning up toward Lower North Slope. 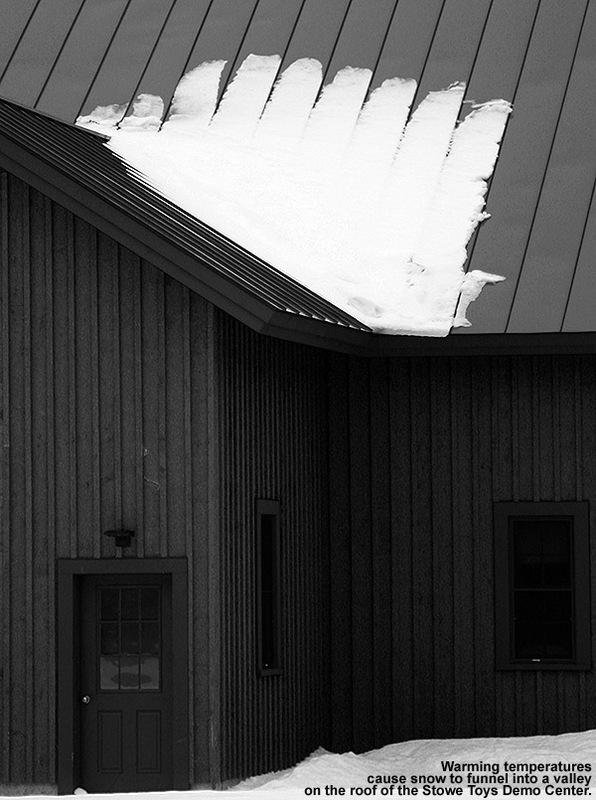 With an inch or two of natural snow supplemented by some snowmaking blow-over, the look and feel of the snow on that first pitch above the parking lot was quite encouraging. There was an occasional skier here or there on the slopes, but as one might expect on a pre-season midweek day without any obvious storms having gone through the area, it was pretty quiet. The snowmaking lines were definitely charged in many areas, but with the marginal temperatures, the guns seemed to be on hold. That kept the scene especially peaceful. I ascended at first via North Slope, and while Lower North Slope had seen a massive bombardment of manmade snow thanks to the cold temperatures, above Crossover the surface was a refrozen mess that had either seen snowcat/snowmobile traffic or previous skiers. The uneven surface was occasionally slick enough to cause some skin slippage on the steepest pitches, so at the top of the Mountain Triple at ~2,700’ I switched over to Toll Road for a change of pace. The skinning there was delightful, with a track recently made by another skier in a couple inches of powder. I continued on up Sunrise and Lower Ridgeview, and finally stopped my ascent at the next junction with Toll Road at 3,300’. Based on what I’d seen during my meandering climb of the mountain, I liked the prospects for starting out with some turns in the powder along the edges of Toll Road. 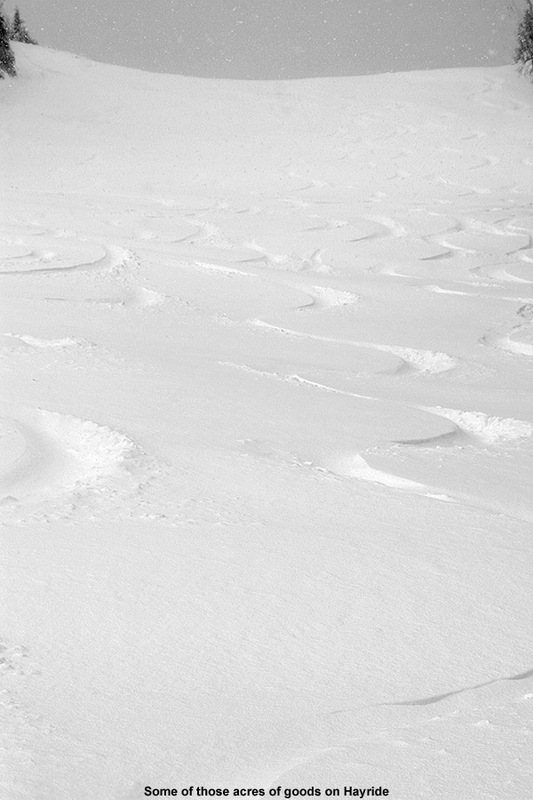 In general, slopes that hadn’t seen fresh snowmaking were going to be a scratchy mess of refrozen corduroy, bumpy snow, or worse yet, snow that had been beaten up by the treads of machinery… and then solidified. 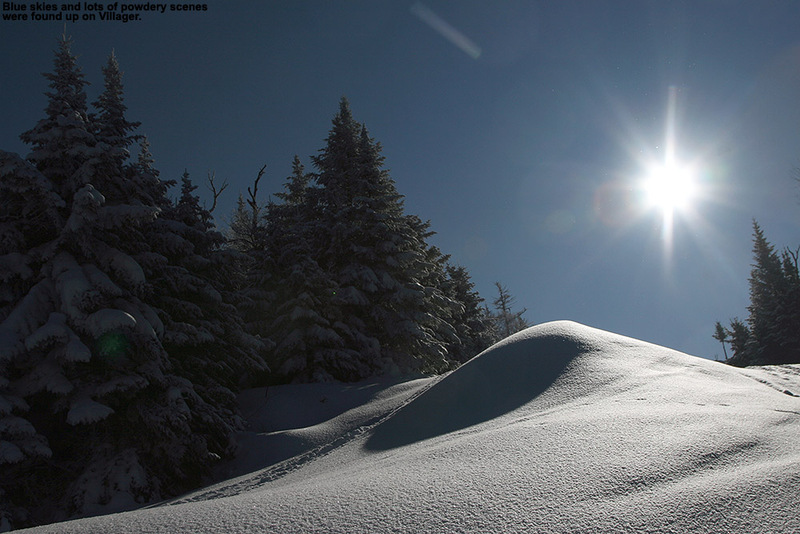 I started down Toll Road, and indeed the surface was as expected – where vehicles had traveled it was very disheveled, but fortunately the edges held frequent untouched powder of a couple inches that made for some smooth turns on the gentle pitches. Sunrise was steeper and held the occasional good pocket of powder off to the sides, but generally the scratchy, messy snow that marked the low end of today’s spectrum of conditions. 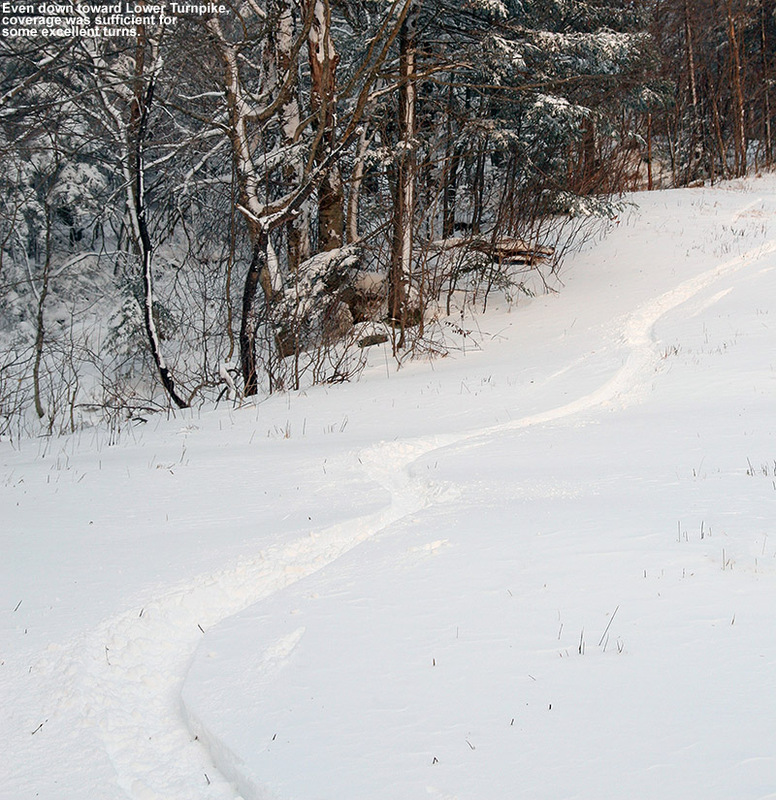 However, when I found myself on Gulch I was greeted with some freshly-made snow that produced some great turns. There was quite a mix of options on Gulch, with turns on the manmade and occasional jaunts into the natural snow where nothing had been blown. Like Sunday, at Crossover I once again found myself looking down Lower Lord at some impressive snow – it was that mix of natural bolstered by manmade, and I got about 10 turns worth of good stuff before I cut through the trees over to Lower North Slope. Natural snow almost always trumps manmade snow, but for today, I actually might have to give top honors for most fun turns to that freshly-made stuff on Lower North Slope. Where it hadn’t been touched by any equipment, which was fortunately most of the slope, it was billiard table smooth – and it offered up turns just as smooth. You would shave off just a half inch or so of that snow and the turns were dreamy. 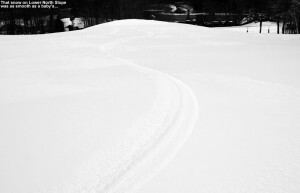 The surface seemed so durable despite its softness, and it made me wonder how a non-groomed surface like that would hold up to skier traffic. It was a really fun way to finish off the run. So, although the base depths certainly aren’t up close to the two foot mark the way they were last week, the base of 7 inches or so up high is right around average – and we’re not talking about 7 inches of fluff, this is stuff that has already been consolidated by the warmer temperatures from earlier in the week. I think we’re going to see some interesting options in the higher elevations when natural snow moves in and starts to build upon what’s there. And, we may not have to wait long – the forecast suggests that we’ve got three potential systems moving through in the next few days, and possibly even a fourth, larger system, in the middle of next week. That one is still too far out in the modeling world to really be considered likely at this point, but it’s got people’s interest because it could be a coastal storm with more copious amounts of moisture. In any event, the first three events are much more likely, and should be almost exclusively snow in the mountains. I’m curious to see what we get out of these systems, because as we know, the Northern Greens can often take these smaller snow events, run with them, and deliver the goods. 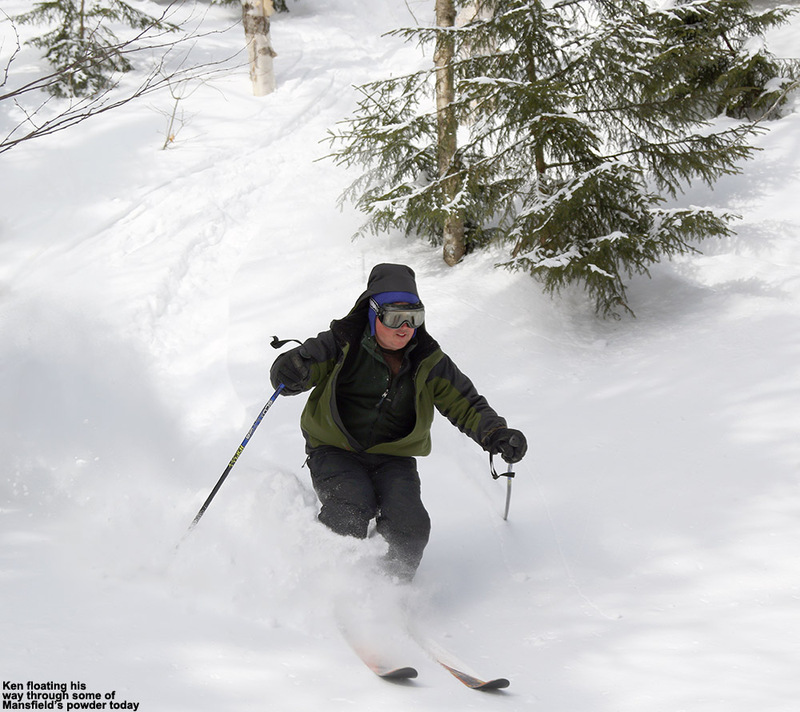 You had to hunt a bit more today due to skier traffic and wind, but great powder is still out there. 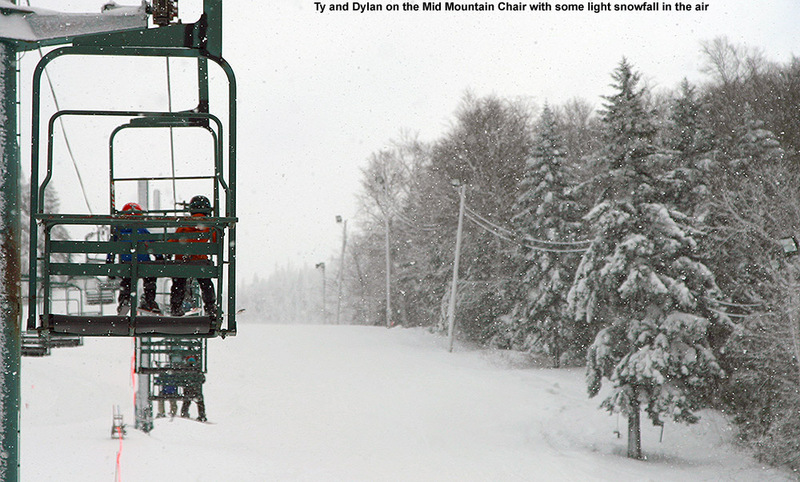 When it comes to the Northern Greens, it can be hard to know when a snowstorm is complete. Just when you think an event is finally winding down, these mountains can cause it to fire back up and dump another foot of snow. In this case, that’s just what happened. After Tuesday’s great outing on Mt. Mansfield, I figured there wouldn’t be enough additional snow to lure me back out on the slopes too quickly, but I was wrong. 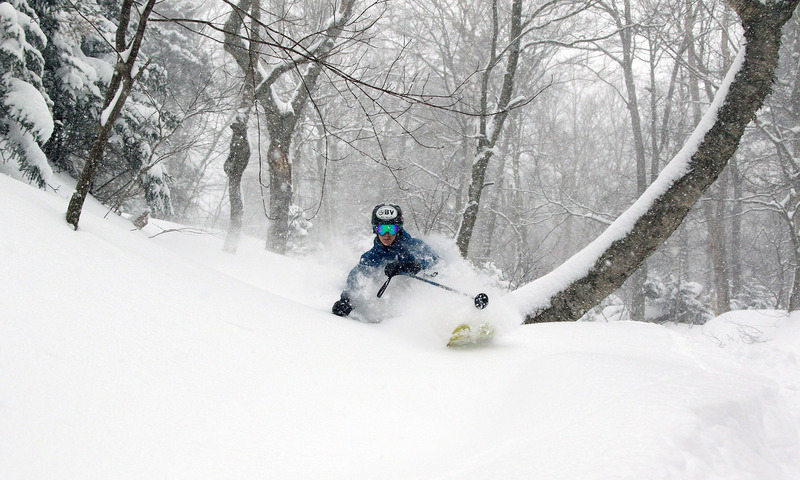 While people anticipated a couple of additional inches to fall as the event finished up, a foot of additional snow was reported at Jay Peak, and another half foot at Stowe. There was already plenty of base in place, so after hearing first hand reports from some of our students at UVM about the great skiing brought about by the additional snow in the mountains, and seeing pictures like the one Powderfreak posted from Jay Peak, I heard the slopes calling again. 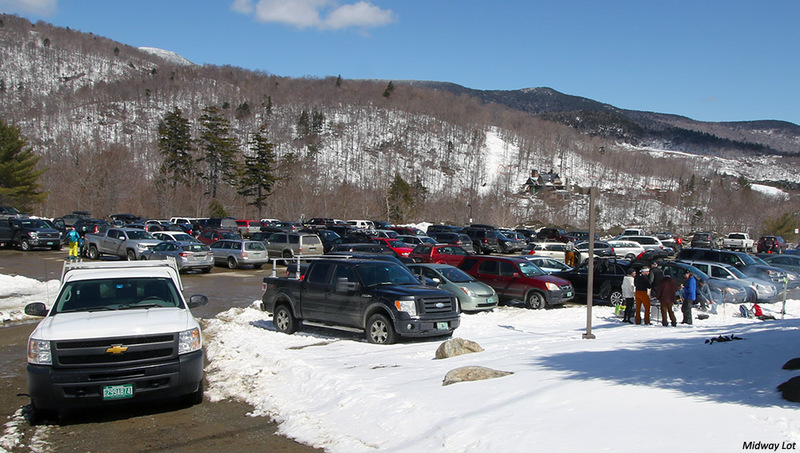 So I headed out to Stowe for another early morning session, and the temperature was definitely warmer this morning than what I encountered on Tuesday – it was even a bit above freezing in some of the mountain valleys, and around the freezing mark at the Midway Lot (~1,600’). The snow was still dry, but what was immediately evident was that the snow conditions aren’t as pristine now as they were a couple of days ago. The decrease in quality I saw was due to a combination of skier traffic and wind, and in those areas that were affected, the fresh fluff that fell yesterday was beaten down into something much denser. Since the snow had that wind crust in areas, it was a little harder to efficiently probe the snowpack depths on my ascent, but in general nothing has really melted over the past couple of days, and the snow depths with respect to elevation seemed fairly similar to the numbers provided in Tuesday’s report. I went with yet another ascent route today, and ascended the skin track up Midway that continued on to Liftline. This is the route that I had used last November, and it was a little frustrating at that point because I was using skins cut to Atomic RT-86s that were a bit too narrow for my AMPerages. I’ve got full-width skins now, so the issues from that day were resolved, but I was still slipping a bit up part of the Liftline skin track, and I’ve decided that it’s due to the fact that people have put in a skin track that’s just a little too steep. People should incorporate a few more switchbacks on the Liftline route to get a more reasonable grade on the ascent; it typically ends up being more efficient in the long run. In any event, while I’d seen some decent, soft looking snow on Midway, Liftline was exposed and was riddled with wind crust. 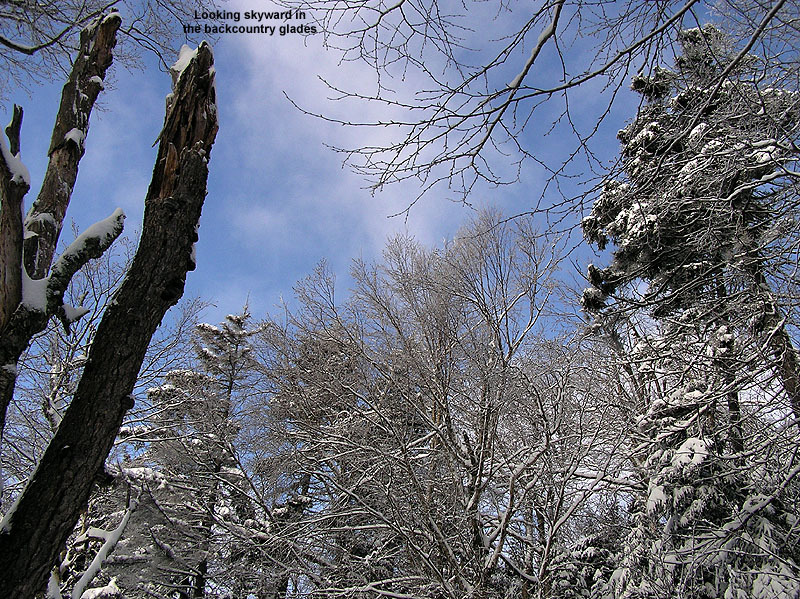 I watched a group of three guys descending the trail, and it was obvious from how little they were sinking into the snow that the wind crust was indeed substantial. 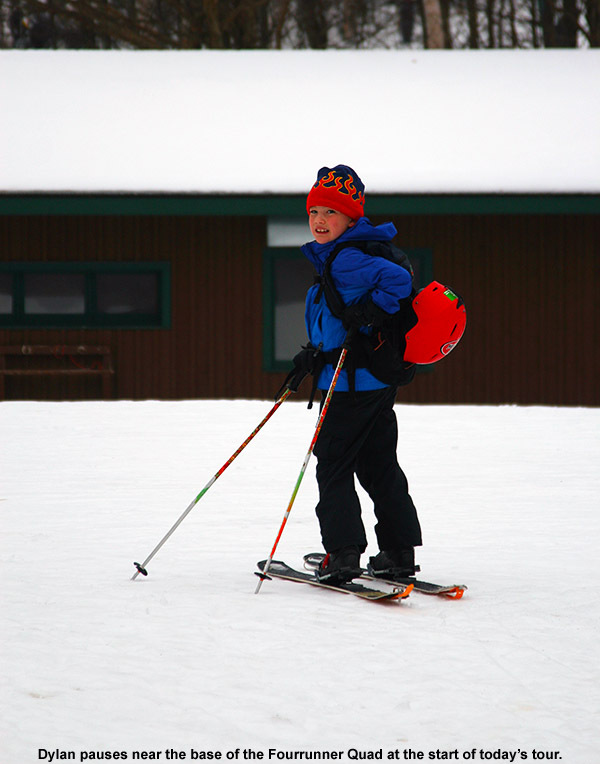 One of the three appeared to be an excellent Telemark skier, and at one point he went head over heels dealing with the challenging snow. Seeing that spectacle, I decided to go for something more protected, and Goat came to mind. 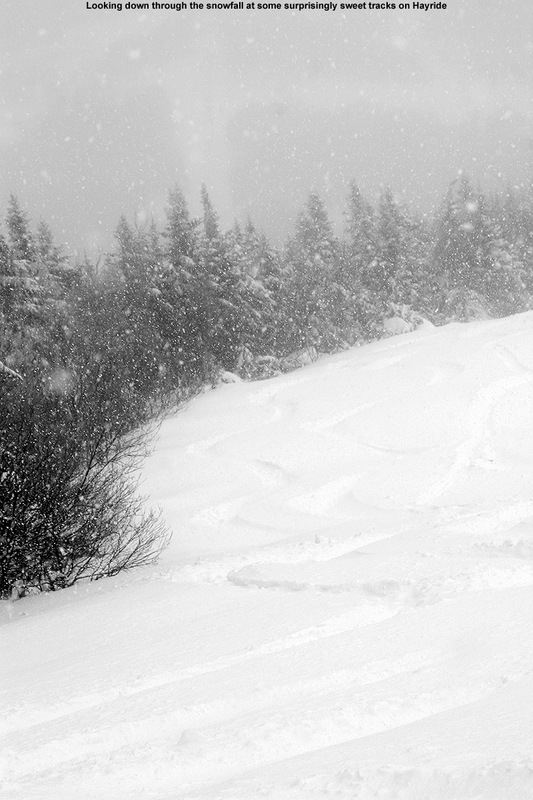 Some wind had still gotten in there, but it was far more protected than Liftline. I’m more leery about trails like Goat in the early season, since it holds a lot of interesting rocks, but as I probed along the skier’s left of the trail, I found a solid two feet of snow. That definitely looked sufficient for skiing the trail. With still a little trickiness to the snow, and the narrow, bumpy, rough and tumble nature of Goat, I found myself making plenty of alpine turns at first. I’ve got to say, I’d love to have another pair of these AMPerages mounted alpine, because they were a heck of a lot of fun in that snow – they created such a stable platform. The farther down I went on the trail, the more protected and fluffier the snow was, and I finished off with some beautifully soft turns on Lower National, which had seen a lot less traffic than the bottom of Lower Nosedive. Coverage remains quite good, and I even passed through some woods on my traverse to Lower National that could easily have been skied. 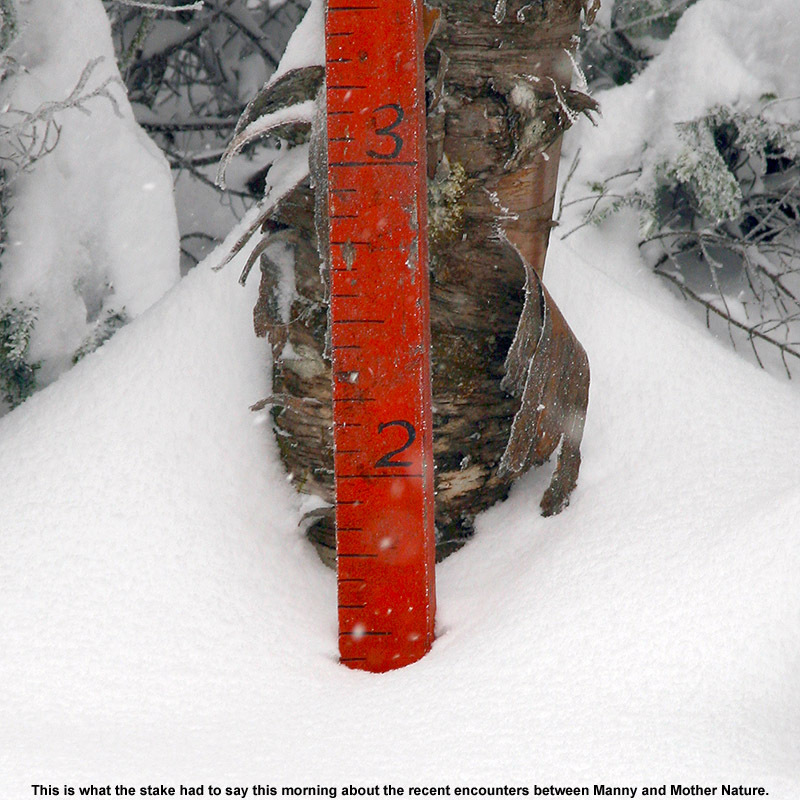 That’s certainly consistent with the snow depth at the Mt. Mansfield stake hovering close to that 24” mark. It was definitely warming up when I left, and I felt a little stickiness in the snow in the very lowest elevations (last couple hundred feet), so I’d say the snow down there will lose some of its fluffiness. There’s still plenty of snow out there for those that want to make turns, but you just have to pick the lesser used areas now if you want untracked snow. It also may mean going a bit higher to get into the winter snow, depending on how high the freezing line crept upwards today. It’s been a couple of weeks since those powder days back in October, and there hadn’t been much in the way of new snow, but over the past few days, early winter weather has returned and been the rule. 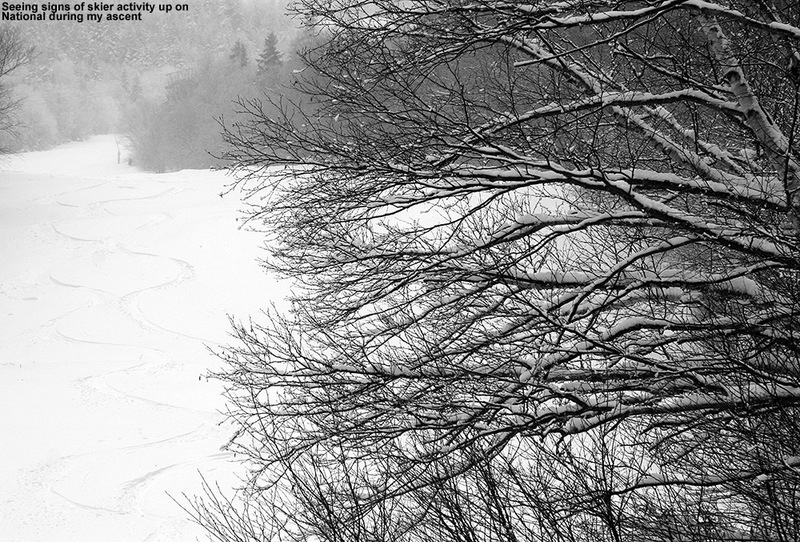 A fairly small Alberta Clipper system came through the area over the weekend, and in typical Northern Greens style, Mt. 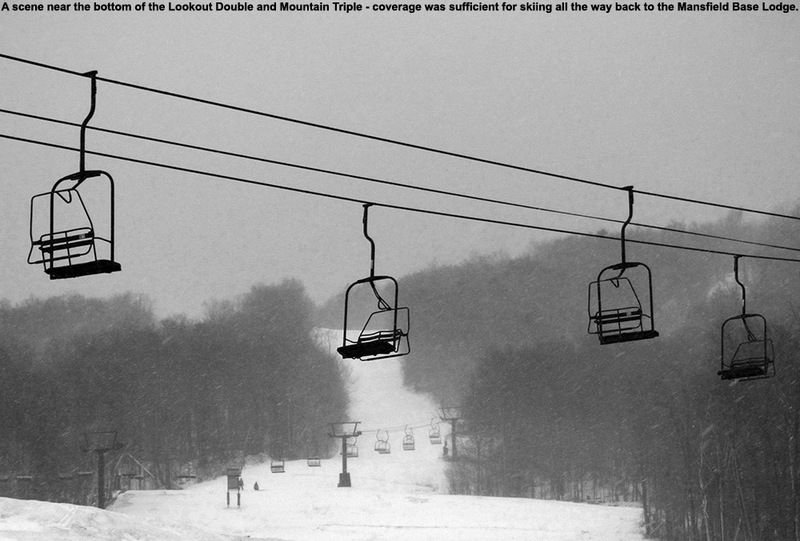 Mansfield was able to turn it into a decent shot of early season white. As of yesterday, reports of 12-18” of new snow were already coming in, and it didn’t take long for photos of the powder to appear from Powderfreak. We soon saw pictures from the FIS crew and even from the National Weather Service, as one of their meteorologists got out to enjoy his forecast. 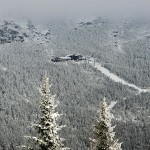 The initial reports indicated that the snow had been reasonably dense, setting up a substantial covering of the slopes, and with another round of even colder, drier powder anticipated overnight with a frontal passage, it looked like Tuesday held the potential for some sweet, early season turns. The front came through overnight as expected, dropping about an inch of snow down at our house, and more in the higher elevations. Things seemed to have come together, so I decided to head out to Stowe for an early ski tour. Temperatures were generally in the mid 20s F as I traveled through the mountain valleys, and there were no issues with the roads until I started climbing up toward the mountain around 1,000’. Above that elevation I found enough packed ice and snow that it warranted a bit more cautious driving. At the Midway Parking Lot (1,600’), the temperature was 20 F and there was light snow falling. 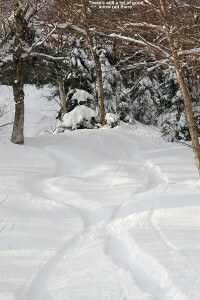 There was the usual crowd of early morning skiers heading out and returning from the slopes, and I suspected it would be easy to find a nicely established skin track on any of the typical routes. 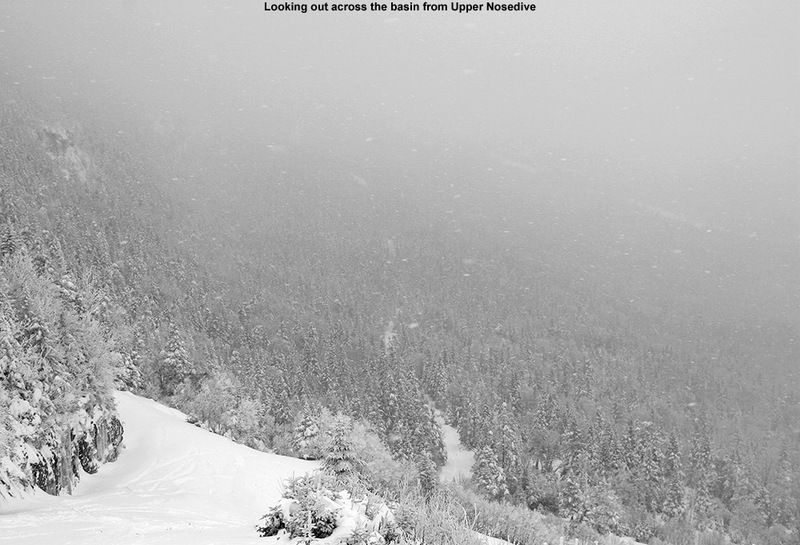 Above ~2,500’, I was essentially well into the deep stuff, and the gains in snow depth weren’t huge beyond that. Of course, when you’re already talking 12-18” of snow with plenty of substance to it, the lack of additional increases isn’t a big deal. At the top of Nosedive, I continued my ascent up the Toll Road for a few more minutes to check in on the depth of the snowpack at the fabled Mt. Mansfield Stake. 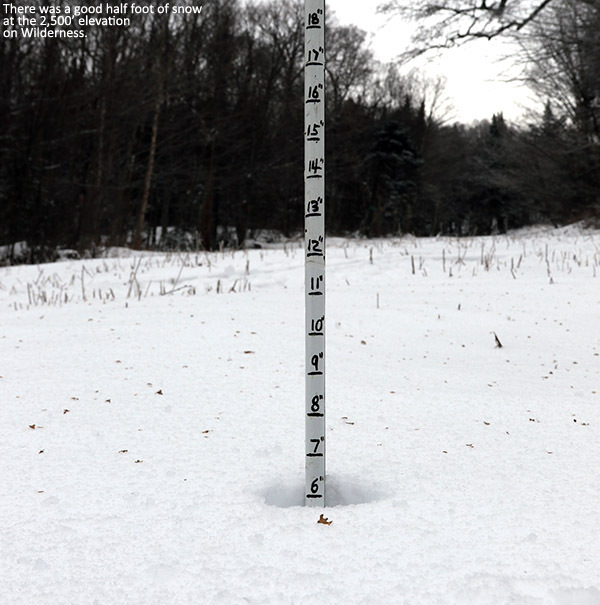 At ~3,700’, the stake showed at least 17” of snow, and I generally found 18-19” there when I probed on the edge of the Toll Road itself, so indeed the snow depth up there was right around a foot and a half. It’s really a nice sheltered area up along the road by the stake, and since the snow wasn’t perturbed by wind, you could definitely get a sense for where the snow stood with respect to quality. Indeed that quality was looking very good. 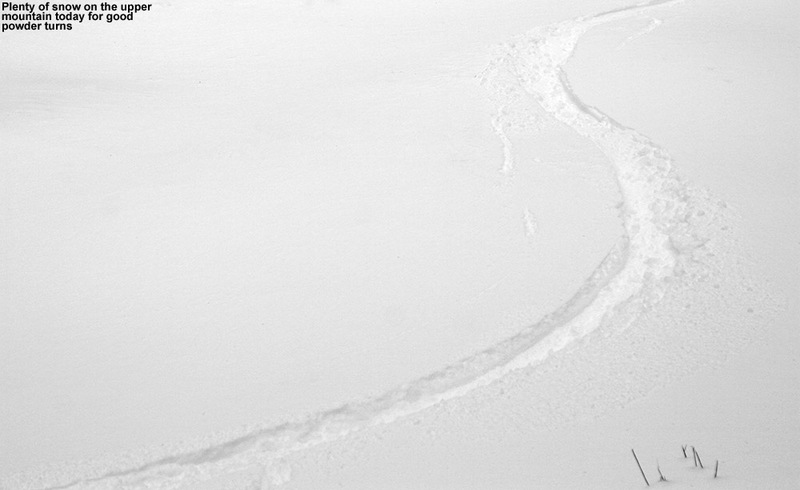 As one would expect with the latest round of fluff, the snowpack was right side up with the lightest snow on top, and it was primed and ready for some turns. Big, dendritic flakes were falling while I was there switching over for the descent, and I stood and savored the moment for a while before pushing off down the road. 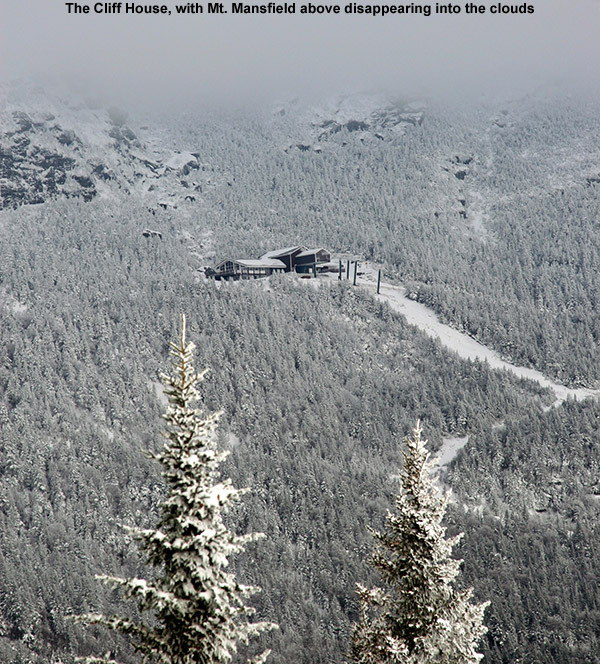 I crossed over toward the Fourrunner Quad, and the summit area was awash in manmade snow. I didn’t even see that many guns going up there – I think the resort has already been able to hammer that area with manmade snow with the cold temperatures we’ve had. So now I’m left with just one more thing to discuss, the pièce de résistance for the day… the descent. While ascending Nosedive, it was clear that there had been a huge bolus of snow dropped above 2,500’, so coverage wasn’t going to be an issue. Temperatures were certainly not in question either, since it must have been somewhere in the teens F. That left the aspects of snow density and the effects of the wind, and based on the turns I was seeing by people descending Nosedive, it looked like the skiing was going to be fine, even if not sublime. But, I suspected I could do better. 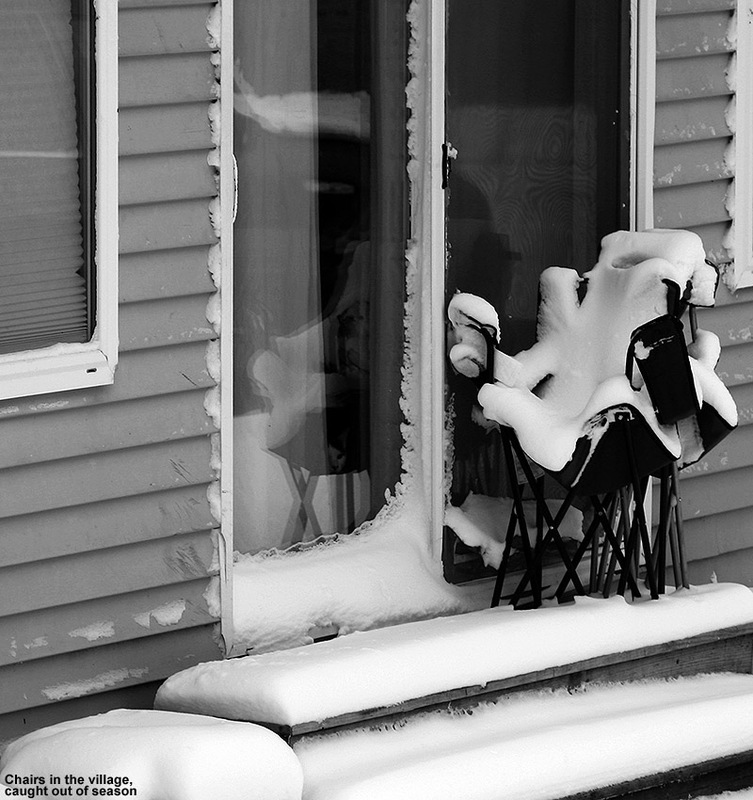 There had definitely been some wind on Nosedive that appeared to have packed out the snow a bit. 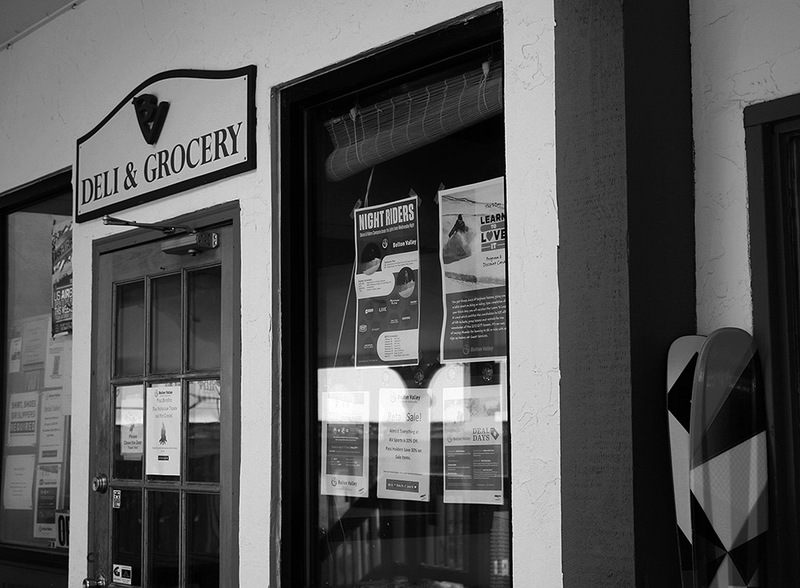 With that in mind, I decided to roll the dice and check out another descent route – Hayride. I’d had good luck on Hayride back on April 10th of last year, when Mt. Mansfield got laced with over two feet of dense, resurfacing snow. 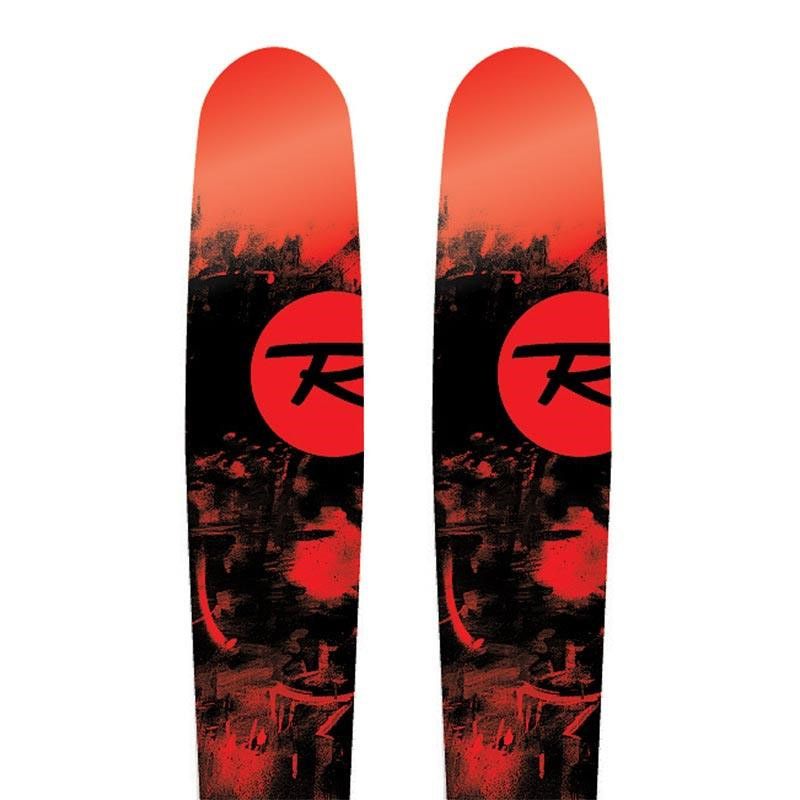 It was actually the challenge of that snow on Telemark gear that was one of the final nails in the coffin in convincing me to finally get some fat, rockered skis for Telemark use. I could already tell that today’s snow conditions were nothing like what I encountered on that April outing – with the new fluff, this snow was notably drier. I hadn’t actually thought that it would be anywhere near the quality of what we had last November on the 30th, but after a few turns on Hayride I found that it was certainly in the same league. 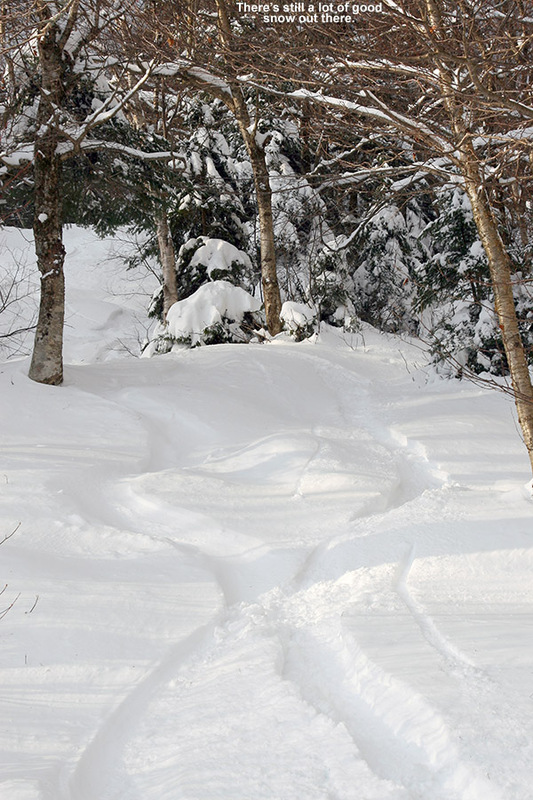 And indeed we’re talking quite the league – Hayride was sheltered from the wind, so turn after turn after turn I was able to push hard on the deep snow. It gave way, let you sink in, but pushed back with just enough force to keep you from getting to the ground. With 115 mm underfoot and judicious line choice, I think I touched down twice on something other than snow on the entire descent. Just like last November, the AMPerages were totally in their element, letting me play around in the deep snow on a remarkably stable platform. They helped out immensely with fore-aft balance, and I can recall some specific instances where I was saved from what easily could have been a face plant. If someone had asked me about ski choice for today, I would have just said to take your fattest skis, whether they’re brand new or not. 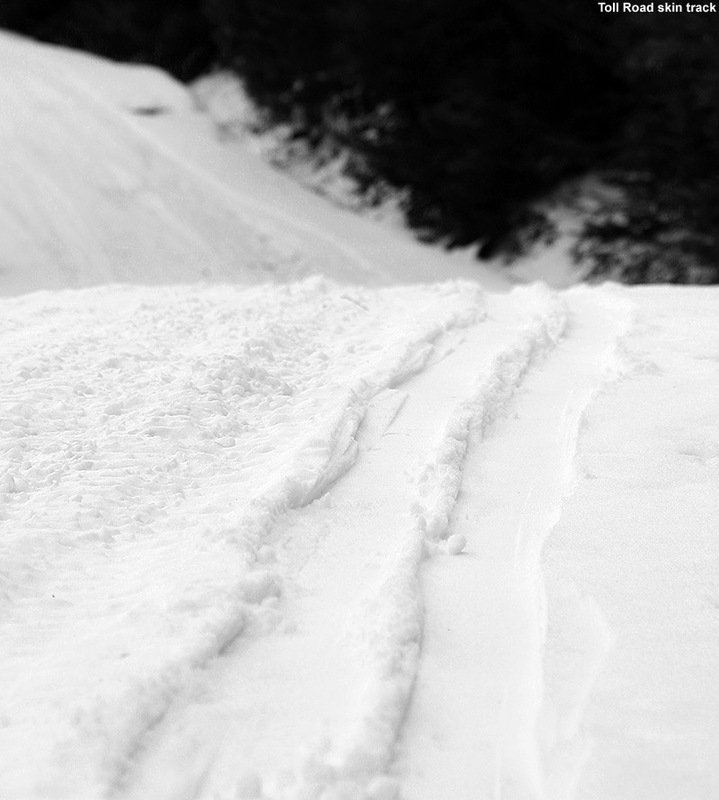 Today, a combination of fat skis with the available snow would be plenty to keep you safely above most underlying obstacles. You’d probably end up having a heck of a lot of fun as well.